What is the difference between a dad and mom when it comes to parenting? People are different and so are men and women .We are the best parents to our little girl.When it comes to different ways of parenting I have observed a few things, but it definitely is not a general observation. Daddy always plays however tired he is. Mummy always insist on 1 healthy food fruit or vegetables.It doesn’t matter whether cook absent or not. This is not negotiable. Daddy helps revise before exams.Mommy believes in 20 minutes of study time, for 3 hours of play time. This works great.Since Rai is only five, it’s more work for me if I have to make her sit longer. Daddy loves running around and playing catch. Mommy likes drawing and coloring with me. Mommy wants Rai to understand when she is meditating also known as snoozing in the afternoon. Dad never naps. Mommy and Daddy both try their best.But it’s sometimes 60/40 and 40/60 at others. Parenting is a Tango, best done as a couple! It’s fulfilling fun and the biggest learning opportunity as an adult.Unfortunately, we don’t get a certificate. Only a well-balanced, healthy, kind human, who is the product of our love, life, insecurities and challenges.Blessing and life’s work all rolled in one. If both parents want to work and take care of their children the traditional roles need to overlap and merge.We both need to be mommy and daddy .The best from both ! Check out the Giveaway news here. Both Kreativemommy and Healthwealthbridge got listed in the Indian Top Blog directory. The first MMM Ebook was released. 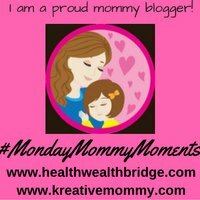 All #MondayMommyMoments participants who sent their consent for the post to be included are featured here. If you want to join in this MMMEbook series.Just write to me at dramrita@healthwealthbridge.com. See how amazing the flipping book feature is. Click the blue button and join the linky. Oh yes dad takes roles that are fun. But both work together to make it work. Parenting is a balance which needs both mom and dad. Really liked your description of the arial view and ground zero view of parenting. And yes the MMM ebook looks amazing. I agree that parenting is a couple job. A child needs both of them that makes a family complete.